Marshall Warren Nirenberg, PhD, who won a Nobel Prize for deciphering the genetic code, died of cancer at his home in New York City on January 15. He was 82. In 1959, Nirenberg was chosen as a postdoctoral fellow of the Public Health Service’s Section on Metabolic Enzymes at the National Institute of Arthritis, Metabolism, and Digestive Diseases (NIAMDD), a part of the National Institutes of Health, in Bethesda, Maryland. The following year, he joined the staff as a research biochemist. By 1962, his pioneering interpretation of the genetic code was recognized worldwide as a major scientific breakthrough. In 1968, he became the first federal government employee to win a Nobel prize in Physiology or Medicine. He shared the award with Robert W. Holley of Cornell University and Har Gobind Khorana of the University of Wisconsin at Madison. Nirenberg was acclaimed by many prestigious scientific organizations, including the National Academy of Sciences, the American Academy of Arts and Sciences, the Gairdner Foundation, and the Albert and Mary Lasker Foundation. President Lyndon B. Johnson awarded Nirenberg the National Medal of Science in 1966, and the National Medal of Honor in 1968. In 2001, he was elected to the American Philosophical Society. Marshall Nirenberg’s scientific papers, correspondence, published articles, and photographs are featured on the NLM Web site Profiles in Science. Profiles celebrates 20th century leaders in biomedical research and public health by making available the archival collections of these prominent scientists, physicians and others who have advanced science. For a more personal view of Nirenberg, visitors to the NLM can conduct a virtual interview with him, asking questions about his research in a user-friendly format called “Dialogues in Science.” This voice-activated program is accessible in the NLM Visitor Center. The Visitor Center is on the first floor of Building 38A, the Lister Hill Center and is open Monday through Friday, 9:00 AM to 4:00 PM, except on federal holidays or when groups are touring the facility. 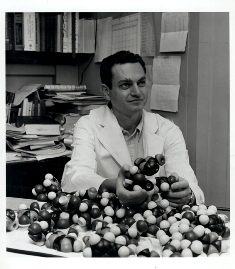 Photo Caption: Marshall Nirenberg poses with a molecular model during the period of the genetic code translation effort. February 17, 2010 in People, Products. How shiny is a Nobel Prize?